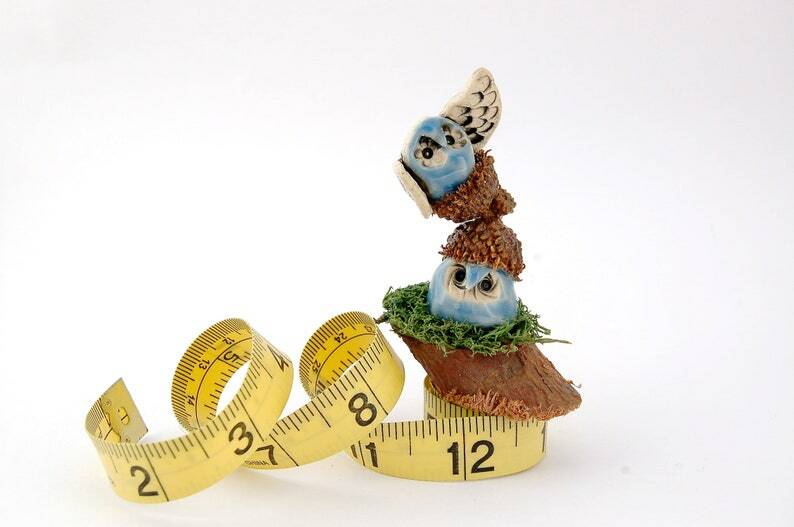 "Balancing Act" is a dynamic woodland scene comprised of two tiny owls atop a mossy green log. One wears an acorn cap hat that holds a rambunctious fella wildly flapping its wings in its acorn cap nest. Both mini ceramic sculptures were formed by the pinch method from balls of smooth, white stoneware clay. Their beaks were hand formed after two vintage buttons created their sweet little eyes. After glazing with a high gloss sky blue celadon glaze - and while they cooled - the acorn caps were sealed with a clear coat of acrylic. Both little guys were affixed in their respective positions using two-part epoxy adhesive. These two are a whole lot of whimsical delight in one small, but finely detailed package! 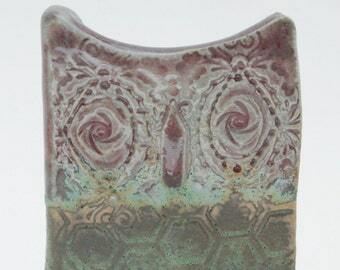 The whole mixed media piece measures 3 inches tall, 2 inches wide and about 1.25 inches in depth.